Beginning in Gümüşlük and following the shores of the ancient regions of Caria and Ionia, this cruise makes for an ideal introduction to the glories of Turkey’s archaeological heritage. It takes in some of the most impressive and best-understood sites in the country, a veritable succession of “must-see” highlights, as well as a number of more intimate “off the beaten track” remains and includes a visit to the astoundingly monumental ruins of Ephesus. Average rating 5 out of 5 from 372 reviews for Cruising to Ephesus, according to AITO reviews. Day 7: A leisurely day cruising around the Bodrum peninsula, to Bodrum itself. In the late afternoon we visit the Mausoleum of Halicarnassus, one of the Seven Wonders of the Ancient World and Bodrum’s magnificent Crusader castle, (due to re-open Spring 2019), which now houses one of the finest museums of underwater archaeology in the world. Disembarkation in Bodrum (approx. 40 minutes from Bodrum airport) is around 09:00. 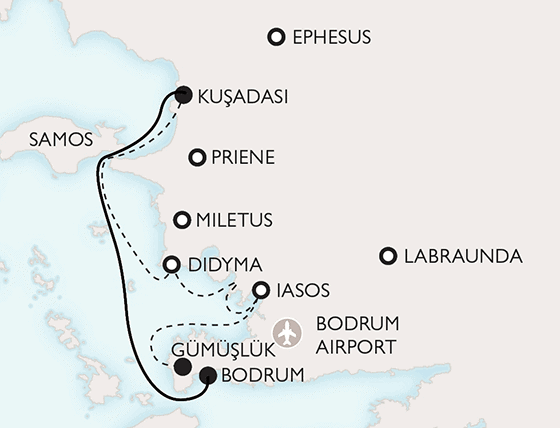 We will arrange local transfers from Bodrum Airport and to Bodrum Airport on the first and last day of the tour. This was my second trip with Peter Sommer Travels, and once again, it was pure pleasure. Every day of the journey reminded me of just why I signed up again: lovely accommodation, wonderful food, and most of all the thrill of knowing that every day would bring a new adventure. Thank you, Peter, for once again proving that your tours are the very best in Turkey. I don't know which was best - the wonderful food, the camaraderie, the sailing and sea breeze, the intellectual stimulation--all of which gave me one of the most interesting and unique holidays I have ever enjoyed.